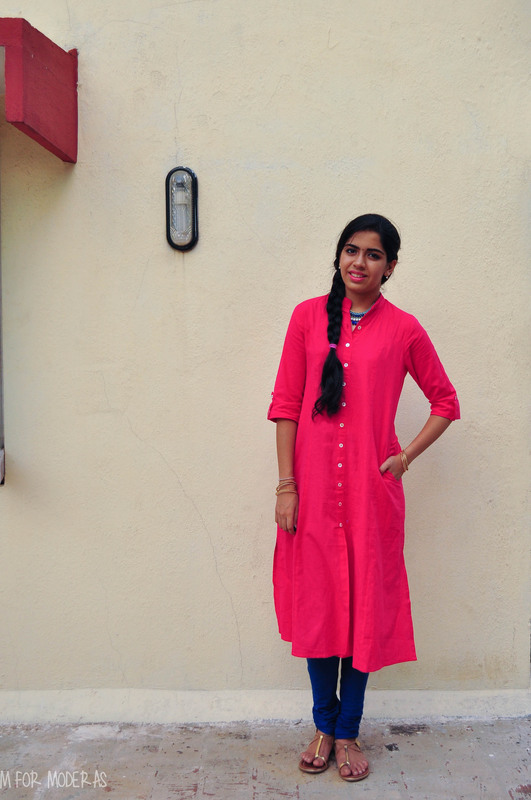 Kurta: Westside; Chudidhar: Biba; Shoes: Bata; Necklace: Linking Road, Mumbai. On lips: Givenchy Le Rouge lipstick in Rose Dressing. I have a fascination with bright colours. This is pretty evident with one look at my wardrobe. I think brights inject personality into your everyday dressing, and they’re fantastic conversation starters. It’s always good to be known for something iconic– I like to think I’m synonymous with bright dressing, because I love wearing coloured blazers, but more on that later. 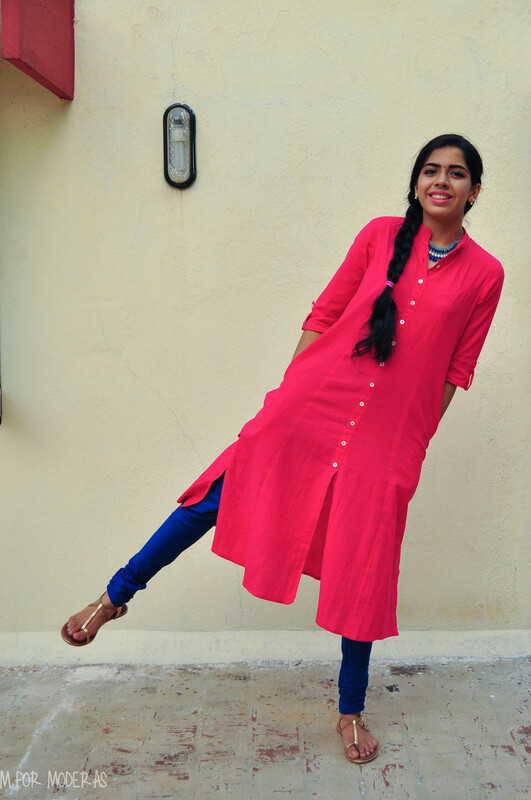 I found this kurta in my wardrobe, tags attached, and since it has been a while since I uploaded an Indian outfit, I thought today would be a good place to restart. A fail-safe family lunch outfit would be anything Indian, and is nicer than what you would wear to college on a regular day. This ticks both boxes. The colour is bright, and happiness-inducing– you can’t help but feel good when you wear it. Hot pink isn’t a colour people wear every day, but I think everyone should wear it more often, and see how it makes them feel. Colours & clothing have a strange way of playing on your mood, and confidence; a little positivity never hurt anyone. 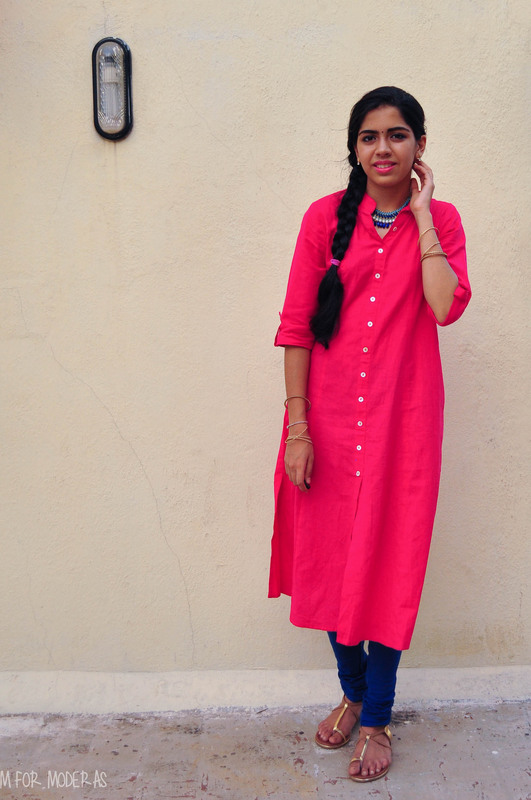 This kurta is breezy, light, and it doesn’t stick to your body– which is great for this weather. But it doesn’t look shapeless, which is a plus. The elbow-length sleeves are universally flattering. 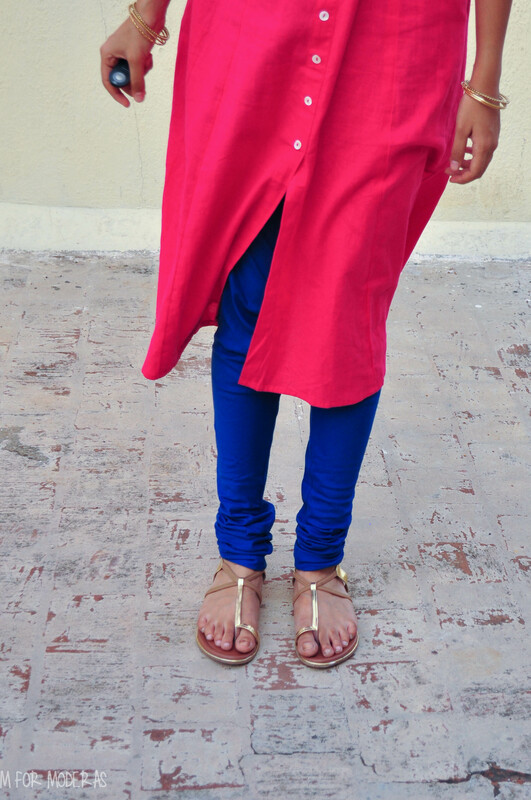 Such kurtas beg to be paired with chudidhars/leggings, in order to balance the silhouette. However, pairing hot pink is tricky. A conventional way to wear it (and other vivid colours) would be to offset with a neutral colour, like tan, taupe, beige, white, grey, et cetera. 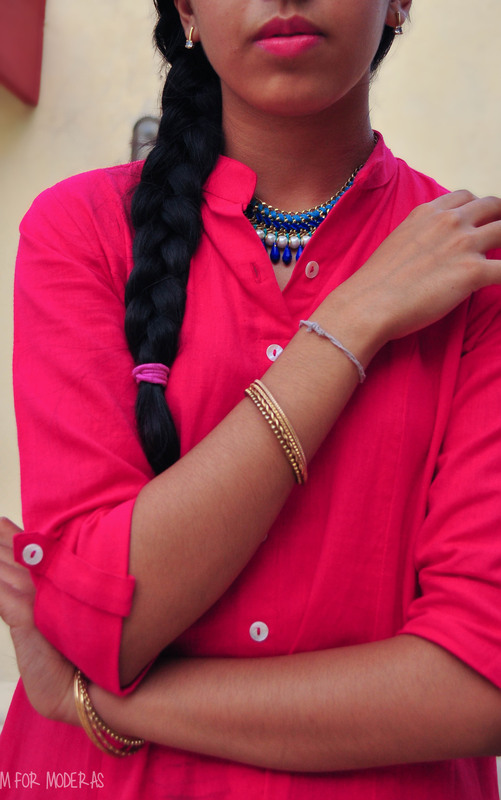 Hot pink + grey is a beautiful pairing. But I didn’t want to neutralise (pun intended) this, I wanted to make it shine. So I took a chance with royal blue. And I’m pretty happy with the end result. A jade would also work wonderfully, now that I think about it. 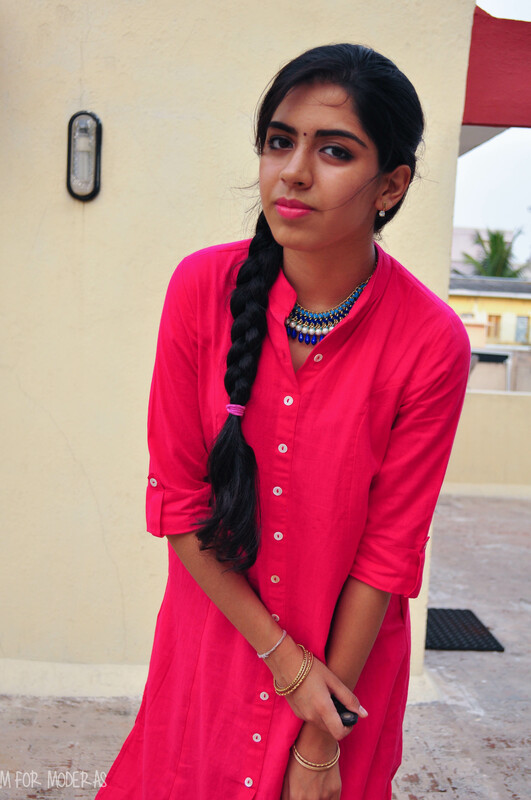 Now to emphasise on the pairing, I wore a blue woven necklace underneath the kurta. Styling tip, wearing a short statement necklace under a collared shirt adds some subtle sparkle + a welcome change from run-of-the-mill styling. I’m definitely doing this more often. Allowing the colour-blocking to shine, I wore neutral shoes– these gold strap sandals from Bata are a new favourite + so easy on the pocket (I love Bata). Since it was bright on bright, I figured a little more bright wouldn’t hurt, so pink lipstick (Givenchy Le Rouge in Rose Dressing) to the rescue. Add bangles that match the shoes, and the outfit is set. Also loving side braids recently, and this one (a reverse side braid) was such an easy one to do! YouTube, you are a godsend. DIY here. Will you be trying hot pink + royal blue this week? I hope you do! It’s a lot easier & a lot less scary than you think. Thanks Sandhya! 🙂 keep reading! very pretty! looking good inthe bright colors! 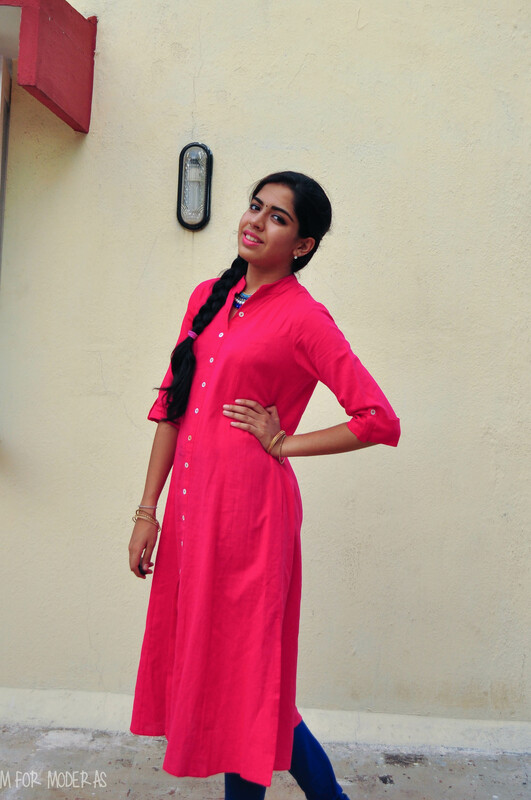 Love the colors of the kurtha and the churidhar! Simple way of writing and should say your blog looks great.